The MetroWest Chamber of Commerce provides multiple opportunities for small businesses to network and develop their connections. 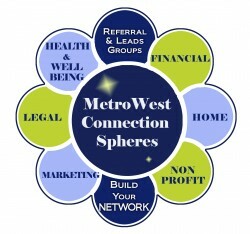 To that end, we created the MetroWest Chamber Connection Spheres at the request of our members. Not exclusive, these "affinity groups" are open to more than one industry type with more than one company from each category. The goal is to enhance our members' understanding and promotion of each other’s businesses through member-led affinity groups. Each sphere can be geared toward specific industry subsets and sometimes, session topics will be of interest "across spheres." The work you do in your sphere will better prepare you to network at Business after Hours events and strengthen your business networks. Each group will have a Chamber member ‘lead’ and meetings will take place at the Chamber office or at Chamber business, as determined by each group. See Calendar of Events for meeting times and locations! If you are interested in creating, joining, or leading a sphere, contact the Chamber at 508-879-5600 info@metrowest.org to inquire.